Working outside Welshpool in Mid Wales, Angus Eickhoff created items of bespoke metal work to commission. Each work was designed by Angus himself and constructed to the highest standards of craftsmanship. 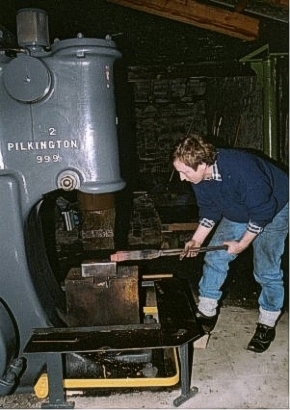 A graduate of Camberwell School of Art in London, Angus undertook further training in blacksmithing and specialised in working with forged steel. 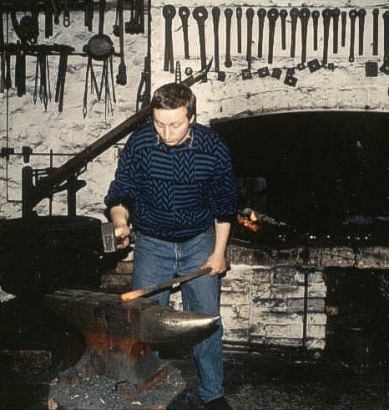 With a design style that lent itself perfectly to the production of contemporary, beautiful, unique furnishings for homes and gardens, Angus's work incorporated all aspects of skilled metalworking whilst preserving traditional techniques. Whilst constantly developing his skills and exploring new design ideas and concepts, Angus used his knowledge of the history of metal working to produce his pieces. His work exists not only as "art" but also often as functioning items, that can be used and enjoyed on a day to day basis. His fully equipped workshop allowed him to produce pieces on any scale and to any specification. Having set up his workshop in 1980, Angus has worked as artist in residence for Bersham Industrial Heritage Centre, near Wrexham, has taught at The University of Central Lancashire and Wrexham College of Art. He has produced commissions for, amongst others; The National Trust, Hampton Court Palace, The Tower of London and The Andrew Logan Museum of Sculpture and received a number of awards for his work throughout his career.